This entry was posted in Uncategorized and tagged Anxiety, Baby, Camera, Child, Children, Children and Adolescents, creative, Crying Baby, Dadding, Data Communications, Family, Fathers, Funny, Home, Infant, IP camera, modern, modern dad, Parent, Parenting, Pregnancy, Remote viewing, Reviews, Security, stay-at-home dad, Staying at Home, Surveillance, technology, Tips & Tricks, Virtual private network, Wireless by The ClarkNova. Bookmark the permalink. Found this, and since my Wife & I are expecting and put one of the Video w/intercom monitors on our registry, I proposed this as a different option. The conversation didn’t go as well as planned: the main sticking point is that she wants a way to carry the viewing end around without tying it to her Android phone. I’ve thought about proposing buying an android tablet as well, but that quickly blows the cost advantage. She also can’t understand how the interface would work for the 2-way voice comm/Pan-tilt control. My description of pitching it like a private Live YouTube video didn’t help on that side. A screenshot of the PC side interface would be wonderful! A screen-cap of it on an Android phone would be even better. Here is the client I’m using on my Android phone. As far as a client for the PC there are a ton of them out there ranging from free to slightly expensive depending on the options and capabilities you want. 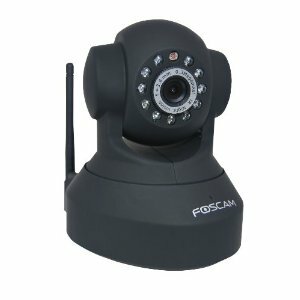 I use the PC client that comes with the Foscam, it has everything I need for my situation. what did you actually go with? Here is what I wound up purchasing for my “baby monitor”. Hope that helps.